During four decades of experience with nuclear weapons, public awareness and discussion have focused on their basic properties and capabilities the explosive power they contain, the technical capabilities of the missiles and aircraft that carry them, the size of the Soviet and American arsenals, and the magnitude of destruction those arsenals could accomplish. Yet little attention has been paid to the technologies, procedures, and organizational arrangements used to manage and control nuclear forces. Many assert the importance of command, control, communications, and intelligence” (C3I), but serious and detailed studies supporting that assertion are few. 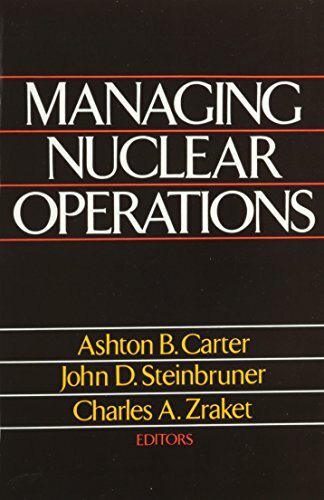 Managing Nuclear Operations provides a comprehensive and detailed examination of U.S. Nuclear operations and command and control. The contributors, experienced in operations and C3I., discuss peace-time safety and control of nuclear weapons worldwide, the survival under nuclear attack of the reasonable command authorities presupposed by deterrence theory, and the means for terminating nuclear war before it escalates to all-out exchanges. They describe command posts, warning sensors, communications technologies, the selection of nuclear targets, and the exercise of political authority over nuclear operations. The decisionmaking process of command and control is examined, as are the various perspectives of the decisionmakers.